QCOSTARICA – The accelerated trade winds from the latter part of last week slowed down Monday, and the humidity off the Pacific coast, prompting thunderstorms and hail in the Central Valley. The thermometer reached 30 degrees Celsius on Monday, a couple of degrees higher than normal. But it fel much, much hotter due to the high level of humidity in the air. It was shortly after 2:30pm when the clouds over San Jose, Heredia, Escazú and Santa Ana started to darken and then the skies opened up, with the heaviest rains dumping on downtown Heredia, Santo Domingo de Heredia, La Aurora (near Cariari in Heredia), Pavas, La Uruca and Escazú. In areas like Tibás, Moravia, Guadalupe, downtown San José and Santa Ana the rains were from moderate to light. 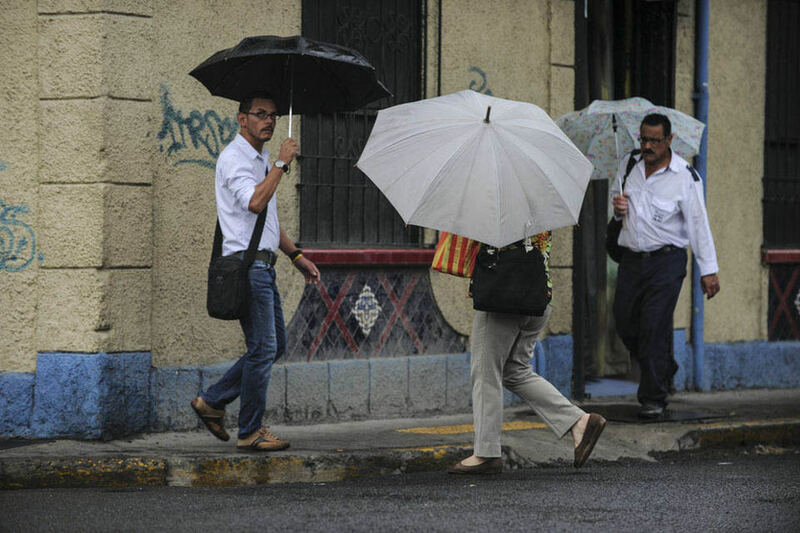 No rain was reported in Alajuela. Heredia also got the first hailstorm of the year. The Instituto Meteorológico Nacional (IMN) – national weather service, from its main sensors located in Aranjuez (San José) and covering a 30 kilometer radius, said it recorded 123 lightning strikes. According to Rebecca Morera of the IMN, for Tuesday, the conditions will be similar: hot and sunny mornings, lots of mugginess and possible moderate rain to thunderstorms in the afternoon. Typically, the hotter and muggier the morning, the more severe the afternoon rains. Although the rainy season has not officially started in the Central Valley, this is just an indication of what is around the corner, as the traditional mid-May season start approaches. Of concern during this transition period are flash floods, landslides in the Pacific coast and Central Valley and drivers should be extremely careful on wet and slick roads.